Members and guests of Victoria Lodge 4629 assembled in the McCausland Suite at Widnes Masonic Hall to welcome a new member into Freemasonry. Pictured from left to right, are: Frank Tuzio, David Jameson, being congratulated by George Shields. David Maurice Jameson was proposed by Frank Tuzio and seconded by David Lewis after he had made several visits to events held by Victoria Lodge, which sparked his interest in Masonry. WM George Shields welcomed the brethren, hoping that they would have a pleasant and memorable evening. He then proceeded to open the lodge and conducted the normal business of the lodge, after which the treasurer Frank Parle, who had attended on the candidate, entered the lodge to confirm that David had signed the book of declaration and had paid the necessary fees. George then invited Frank Tuzio, David’s proposer, to occupy the masters chair for the next part of the ceremony. The candidate, having been prepared by the tyler Ian Black, was announced and admitted into the lodge and then challenged by the inner guard George Saba. He was guided with reverence through the ceremony by the junior deacon Andy Pope, ably assisted by senior deacon John Gibbon. Frank carried out an excellent ceremony, one which David will no doubt remember for a long time to come. The junior warden John Baldwin, gave a faultless explanation of the first degree working tools. David then retired from the lodge to restore himself to his former comforts. On his return the senior deacon David Lewis, David’s seconder, delivered the ancient charge with heartfelt sincerity. 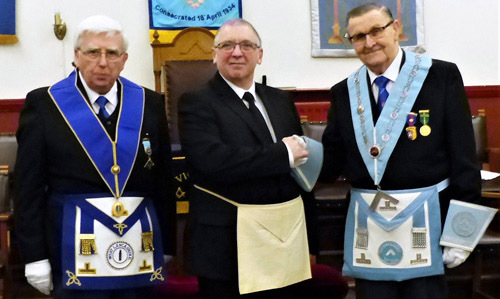 On completion of the ceremony of initiation, Frank congratulated David on becoming a member of Victoria Lodge and hoped that he would have many happy years in Freemasonry. At this stage in the proceedings, Frank asked George to take his rightful place in lodge and thanked him for giving him the honour of initiating David. The lodge was closed in due form and after such a fine evening the brethren retired to the Peter W Browne Suite where the festivities continued. The alms plate raised £47.43 in aid of charities and the raffle £62 for the almoners account. Pictured from left to right, are: John Gibbon (Widnes Group Vice Chairman), George Saba, David Lewis, Ian Black, Frank Tuzio, Davis Jameson, George Shields, Brain Boothroyd, Bill Bushell, John Baldwin and Andy Pope.